pre-populate the text box with "@" and the name of the user you're replying to (removing spaces). Be aware that there's no guarantee that the replied-to user will be notified of the comment -- all the @-reply caveats still apply (see the blog or the community faq for some information). Allow the common "upside-down" unicode characters that have become trendy lately (and some users are using in their names now). Clicking on the icon won't reveal the comment-box anymore. One has to click the "add comment" link, for the comment box to appear, then click on the script icon to add the reply signature into the revealed comment-box. I've made a couple of fixes to make this work again. While I don't fork and ask for a merge, here it is a copy of my script for convenience, the modifications are indicated with comments. The matches of sites has been revised as well. Unable to click on Comment. When i click on the icon then it doesn't show comment box. You need to open the comment box before clicking the arrow. If you need to click the comment box, I think starting tagging user from keyboard is quicker than move your mouse to click the arrow, then start typing the comment. Any chance you could update this again? As noted by several others, clicking the reply link doesn't show the comment field, but if you manually click the "add a comment" link it works fine. 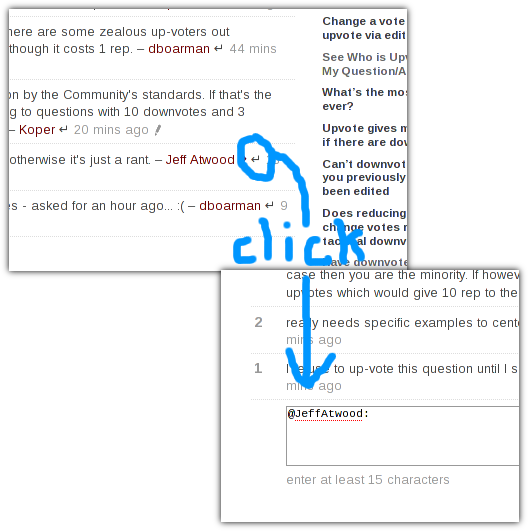 So the thing is, if you have to manually click "add a comment", in most cases it's then easier to use Stack Exchange's tab completion feature than to click the reply button. My issue is that once I click "add a comment", I often forget to add the @mention I want at the beginning until I've already written some of my response, and if I go back to the beginning of my comment to add it, the tab completion no longer works. Also, the last update was made about 4 years ago, and it's been broken since about 3 months after that.